What is a sweet patato? 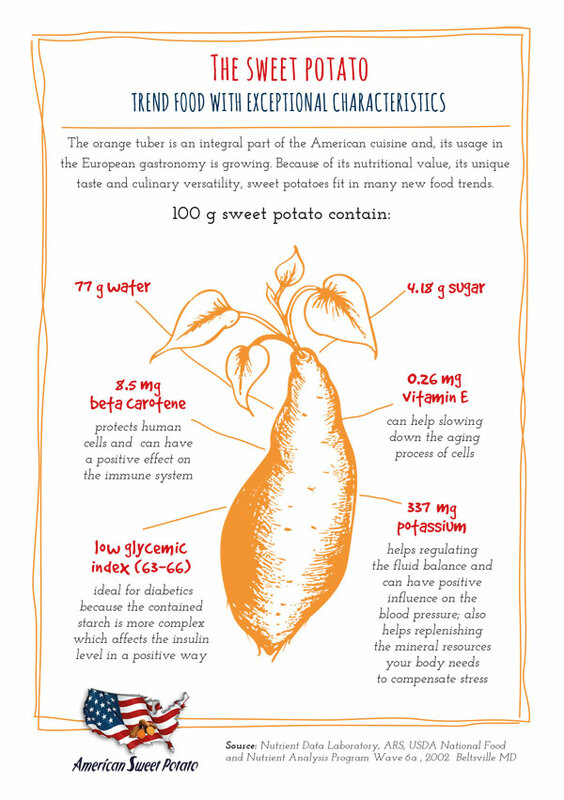 American sweet Potatoes contain many important vitamins and minerals. They stand out by a high level of vitamin C and beta carotene – a pre-stage of vitamin A – that works cell protective and can help to strengthen the immune system. Furthermore sweet potatoes contain plenty of vitamin E which can help to slow down the aging process of cells. A high content of potassium regulates the fluid balance and can help to lower blood pressure. Despite their sweet taste and a high content of starch, they have a low glycemic index (GI) of 63 to 66 and are ideal for diabetics. The contained starch is more complex in comparison to potatoes which affect the insulin level positively. The complex carbohydrates provide the body with energy for a long time preventing the insulin level from rising quickly. Food cravings do not stand a chance! These days, consumers are more concerned about what they eat, how their food is being produced and what impact the manufacture of their food has on the environmental footprint. This trend has led to food concepts like vegetarianism, veganism, clean eating or Paleo®. 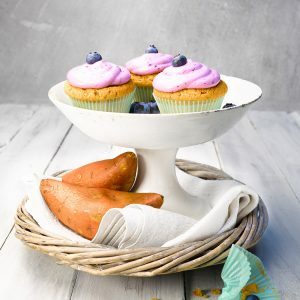 American sweet potatoes can be prepared in versatile ways, combined with numerous health benefits, sweet potatoes are the perfect ingredient for a diversified diet. Nearly all important minerals that would be provided by consuming meat or other animal products are also included in sweet potatoes – so there is no need for meat! Especially the amount of calcium, magnesium and potassium contained is what your body needs in a meatless diet. Additionally, their texture turns them into a great meat substitute. Have you tried vegetarian burger patties of beans and sweet potatoes? For fans of clean eating and Paleo® American sweet potatoes are the perfect choice. If you want to forgo wheat you can use sweet potatoes as a substitute in bread or pasta. Their smooth and creamy texture after cooking makes baked goods extra moist. Because of its natural sweetness, there is no need to add extra sugar which is a big plus for health-conscious consumers. Therefore sweet potatoes are an ideal addition to the everyday menu – no matter what kind of diet you are following. © 2014 Sweet Potatoes EN. All Rights Reserved.